Click here, 2006 picture gallery is UP! Which is kind of a joke since everyone knows Texas is just a Country. 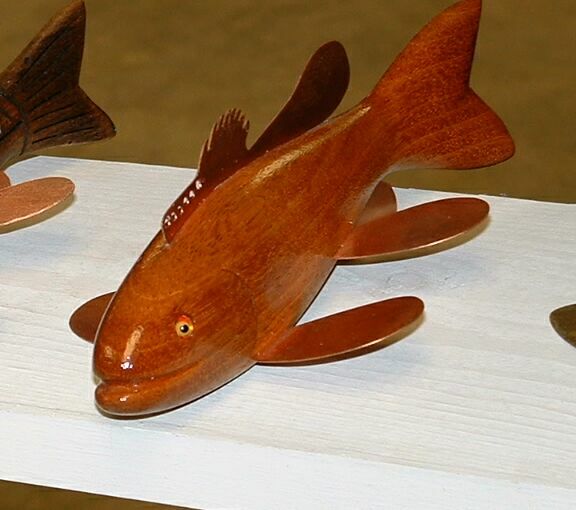 The Texas World Fish Decoy Carving Championship is a Real, and Really World Class, Fish Decoy Carving Contest held each year in conjunction with the Gathering at Perham, The Biggest and Best Fish Decoy Show in the World. 2006 will be the fifth edition of the contest. I'm hoping for the most entries ever. 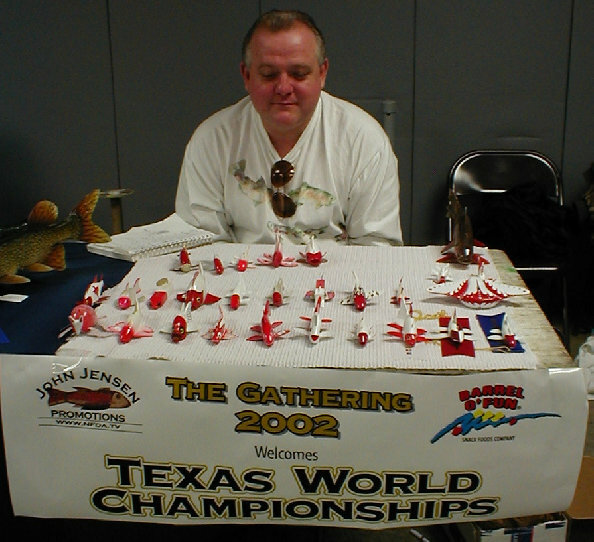 Q: What's the point of the Texas Worlds? 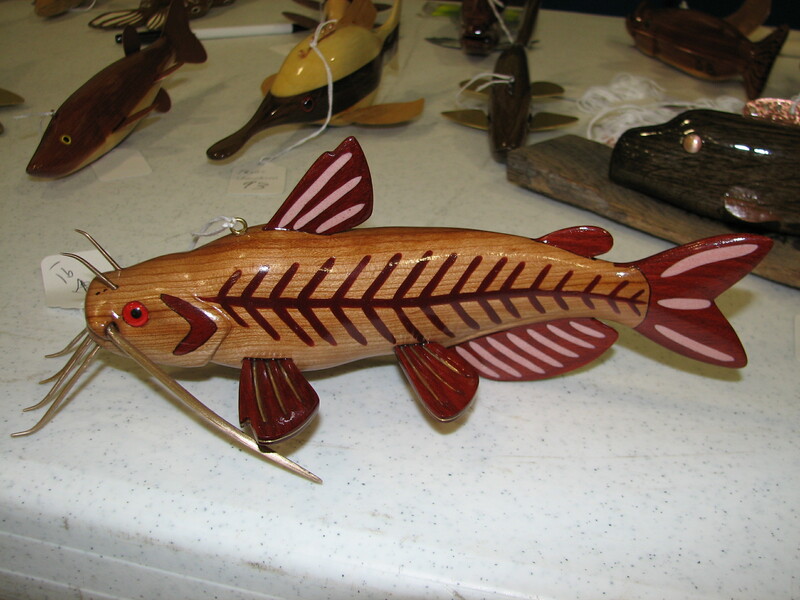 A: To have some fun and support the folk art we chose to be involved with and support fish decoy carving and carving competition and have some fun and build a representative collection of what the guys that make the folk art are carving now and have some fun and support our heritage of angling and have some fun. A: They'll be kept on display privately and when I'm done with them they'll be donated back to an institution in Minnesota that will display them or sell them and use the proceeds to promote the folk art of fish decoy and lure carving or the preservation of nature for fishermen. Q: What's the connection with The Gathering and the Jensen Nationals? A: We're kind of a sideshow. The Gathering is just that. 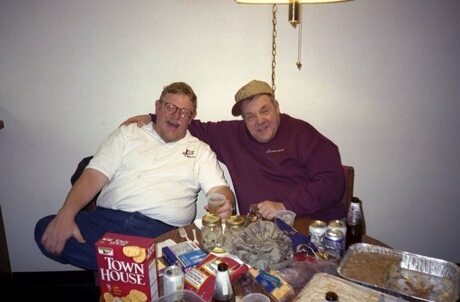 Minnesota's spearing fraternity comes out and everyone is invited and a good time is had by all. 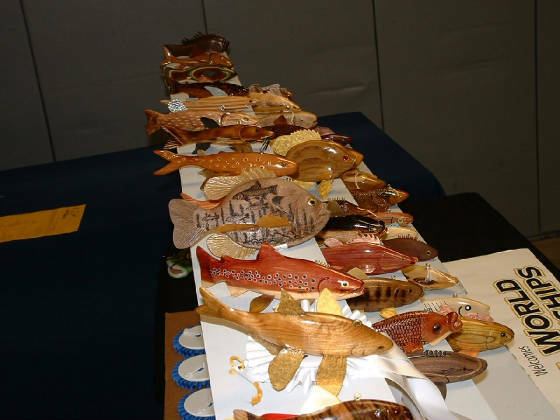 The Jensen National Fish Decoy Carving Championship is held and the Show is unrivaled for quality and quantity of fish. Doug Davis started his fish fry in 2001 and in that spirit I thought it would be cool to have a contest going informally among that group. 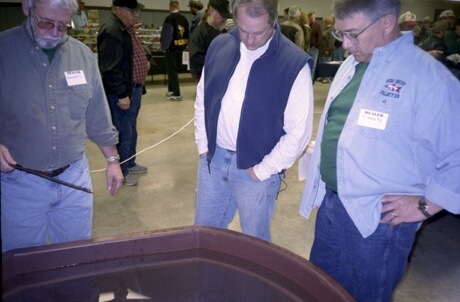 Rod Osvold gave us permission to do it at the Perham show. And ended up setting us up to make it work. We had a great time and everybody saw that the other events had a synergy that made each event better. So we're did it again. With more prizes. It worked great! And so we did it again in 2004 and again it really went over well. 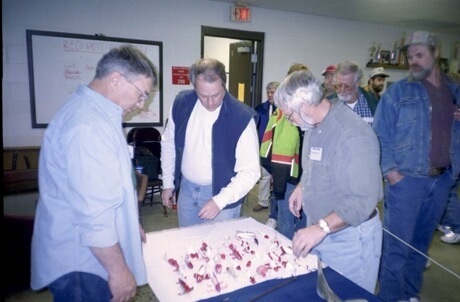 In 2005 we upped the top prize to $1000.00 to attract World class realistic entries and that worked. 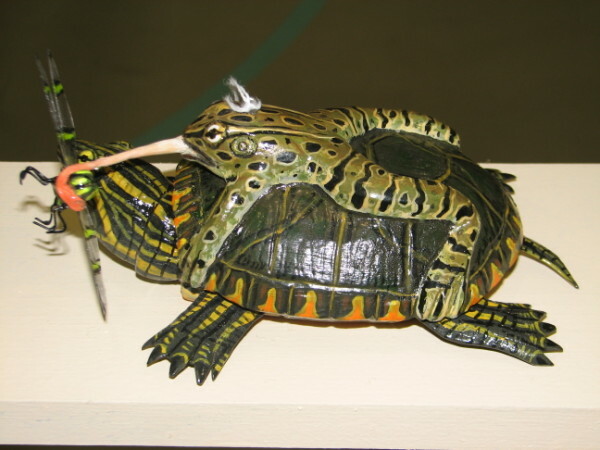 THe top 25 fish are truly world class realistic fish decoys, absolutely remarkable. In 2006 we're going back to folk art. Q: What happened in 2002? There were ten purchase awards and the collection has 28 fish. 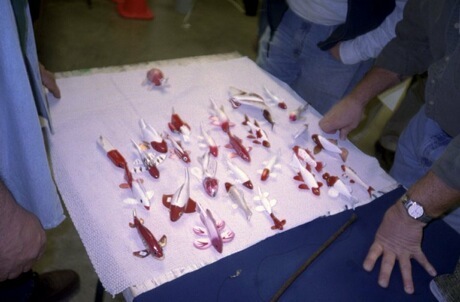 A: 18 of the other 19 carvers DONATED their fish to the collection. John Jensen himself and then every other participant! Valuable decoys like John's and Greg and John Pususta's and Harley Ragan's and John Oman's and Tim Spreck's and everybody else. Unbelievable. What I saw as an act of philanthropy instantly was worth more than the prizes and the eighty-something t-shirts we gave away and the trophys and everything. So in 2003 we did purchases 25 deep and got a few donated and gave the Stillwater Award to Harry's 7' Superfish. It just makes for an amazingly impressive collection and representative of carving in 2003. 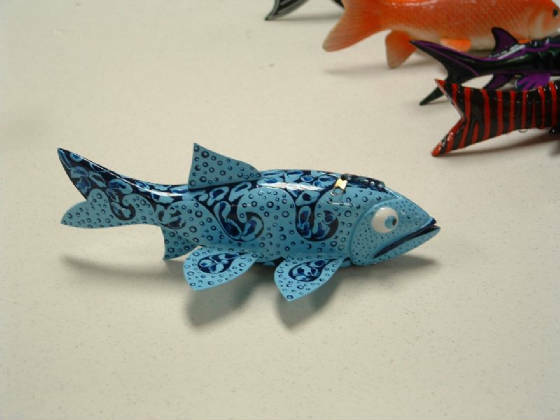 In 2004 Harry carved another monster, this time a Really First class carving and we had 46 entries with lots and lots of creativity and World Class fish over 25 deep. Q: What's the Stillwater/Harry Phillips award? A: When I announced the competition I really envisioned basic red and white workers. I was afraid the top guys wouldn't be happy if they had to do lots of work and then didn't win. My friends immediately began thinking of how to subvert the rules and I overreacted and became a butthead threatening to not allow anything but a very narrow description. And when we saw the entries only HALF of them fit the category. We didn't disqualify anything. So the guys that figured out something creative within the rules got screwed. Their creativity wasn't appreciated. And the guy that had the most creative fish within the rules was from Stillwater. Next year we'll award those fish and anything else we find interesting, up to four fish. Creative rulebreaking became something encouraged. In 2005 we're retiring, er, renaming the award After Harry Phillips, who personifies the contrary and humorous nature that inspired the award. Q: What's with the Realistic Fish in 2005? Isn't a real inclusive Folk Art Designation what made this work? A: YES! I got carried away as usual. Back to folk art in 2006 and from then on. It's more inclusive and more representational of the folk art itself, especially in Minnesota. The rules are up. Please enter, I'm pretty sure you're going to win. Ntional Fish Decoy Association. Join the NFDA!